Harsh midwestern winters figured prominently in my decision to move south (or west) for college when the time came. Then once I moved to Atlanta, my blood thinned even more and going anywhere further north seems almost out of the question entirely. It would have to be quite an opportunity… but that’s for another post. The point I’m trying to get to is food. It’s one of the highlights of fall and winter. Specifically, heartier, more stick-to-your-ribs types of food. Like my chicken and sweet pepper fettuccine. This recipe for chicken and sweet pepper fettuccine is just light enough to be good in the spring and fall, and just heavy enough to really fill you up for a good bit of time. When you’re not in the mood for stew, this makes a perfect substitute with just enough oomph to carry you through the day. Even better, the leftovers reheat like a dream the next day minus the possibility of overflowing a soup bowl like stew is want to do in the microwave. The recipe doesn’t require any fancy spices or foods, many are staples you might already have in the pantry. It’s low-fat, quick to prepare, full of flavor and makes large servings – I guarantee you’ll be full. You can always put some salad alongside or another veggie, but the portion sizes are big enough, it’s certainly not necessary. Add 1 tbsp. olive oil to a large, deep skillet and heat over medium heat. Add minced garlic and saute for two minutes. Cut up chicken breasts into bite-sized pieces, add to skillet and season with paprika, oregano and Tony’s seasoning and cook, stirring frequently until chicken’s cooked through – about 5 to 7 minutes. Toss peppers with the other tablespoon of olive oil and lay on a baking sheet with tin foil. Broil 5 minutes per side or until blistered. Once the peppers have cooled enough to handle, cut off the tops and quarter the peppers. Add peppers and pasta to the large skillet with the chicken, and cook for two more minutes so everything’s thoroughly heated, tossing to combine. Divide up pasta into six servings and sprinkle each with 2 – 3 tbsp of shredded mozzarella cheese. Now that’s a good, healthy serving of chicken fettuccine. 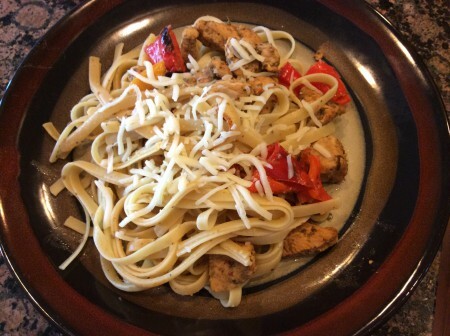 This entry was posted in Entrees, Recipes and tagged Cheese, Chicken, Chicken Fettuccine, Chicken Pasta, Chicken Pepper Fettuccine, Chicken Pepper Pasta, Entrees, Fettuccine, Low-fat, Mozzarella, Pasta, Pepper, Recipes on September 20, 2014 by Paige N..
Pingback: Chicken and sweet pepper fettuccine – Marie, Let's Eat!